Punk was never a genre trying to be taken seriously. That's a good thing since not many people would. Nemas's first album not only embraces this non seriousness vibe, it wallows in it. And that's a good thing! If We Could Play Faster We Would is punk rock, plain and simple. Guitar work is good for a punk band, especially in 'Saturday'. 'Alcohol' and 'Shoes' also have great riffs. 'My Voice' even contains a guitar solo, a rarity for most punk bands. There are bits of variety throughout so the album never drags or fells like it's repeating itself. Songs like 'Saturday', 'Alcohol' and 'Originality' are all very catchy while 'White Dove' has a bit of 'cookie monster' vocals and 'Unknown Soldier' is very bass heavy. The track 'Originality' is a bit ironic. The band complains about the lack of anything original on a place like MTV but Nemas's style of punk isn't very original. But for all we know, that could have been their angle. Overall, If We Could Play Faster We Would may not be the most original thing on the market today but is good nonetheless. There's enough variety to keep a listener interested in the whole album while still making some good single candidates. 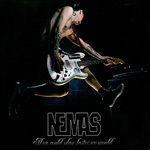 Maybe by their next album, Nemas could learn to play faster. Overall, If We Could Play Faster We Would may not be the most original thing on the market today but is good nonetheless. There's enough variety to keep a listener interested in the whole album.